It offers frequency modulation, amplitude (ring) modulation, phase modulation, additive and subtractive synthesis techniques, all at the same time. 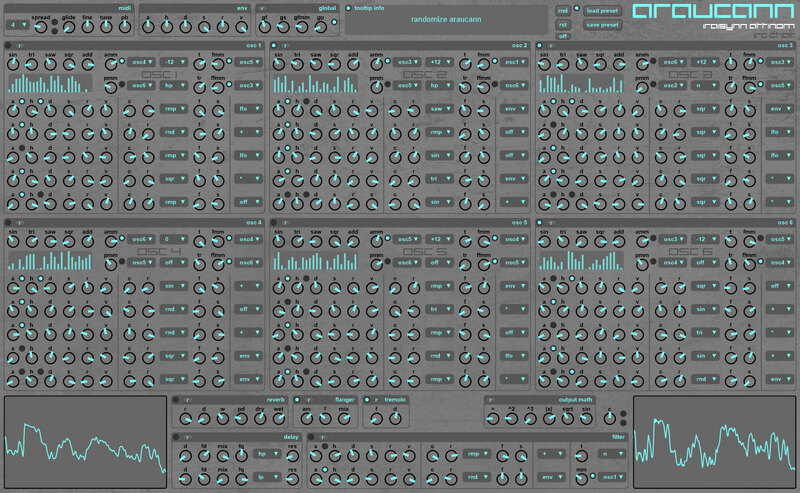 It has 6 filtered oscillators modulated by 32 envLFOs (envelopes and LFOs that interact with each other). araucann does not rely on presets. It is completely randomizable and produces very complex and unique sounds at the push of a button. So I started using this yesterday and It's pretty damn impressive. I'm kinda left baffled and confused using it though - but I think that's half the charm. Randomise, find some sweet spots then randomise certain sections to expand on the sound. It's not something you'd use in a project (unless you have the processing power of a small city). Open a new project, hit the RND button then do some tweaking and bounce out the good bits for further processing. For the price of £21 - I think it's f**king great. The GUI is absolutely baffling, but its doesn't pretend to be anything but confusing. Audio quality is great and the sounds generated can be incredibly unique. Perfect for weird effect hits, drones, 'pads', bass hits and other elements of sound design you'd otherwise spend hours trying to craft. It's great for my workflow and style of production - but for those looking for methodical sound design sessions, it may not be the tool for you.